A search committee has been formed to hire a new CEO for St. Luke's Wood River Medical Center, though no deadline has been set for hiring someone. St. Luke's Wood River board member Bill Boeger is serving as chair of the committee, which includes other members of the board and St. Luke's Health System management. John Kee, former CEO of Magic Valley Regional Medical Center in Twin Falls, took over as CEO of the Wood River hospital in April 2010 on a "long-term temporary" basis. Kee said the search will take as much time as is needed to find the right person. "It's an important decision," he said. It has not been determined whether a national search will take place. Candidates will be looked at locally and within the St. Luke's Health System, Kee said. He said the job description is still in the draft phase, but priority issues for the new CEO will include providing leadership to support a high-quality health-care experience for every patient; building relationships with the community; building relationships with physicians; and continuing to align St. Luke's Wood River with the St. Luke's Health System processes and support services. "These are very high-level goals, but I think they're pretty meaningful," he said. Kee said the ideal candidate will have a skill set that aligns with issues facing health care today. Salary for the position has not been set. Once a new CEO is in place, Kee said, he will return to Boise, where he maintains the title of vice president of physician services at St. Luke's Health System. "I will continue the work that I started (several) years ago," he said. 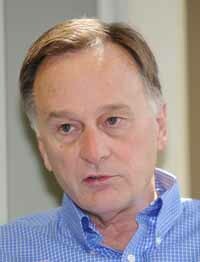 Kee replaced longtime Wood River CEO Bruce Jensen.